Socialism Today - How red is Ed? A few popular, focus-group tested words by Ed Miliband at Labour Party conference have had an electrifying effect. The Tories and their rabid right-wing press howl in indignation, while the few lefts remaining in the Labour Party dream of a new radical turn. But just how red is Ed really? PETER TAAFFE writes. The hysterical response of the Tories and their press, particularly the Daily Mail, to the threat by Ed Miliband to trim the fingernails of the big energy companies says more about the underlying explosive social situation in Britain than it does about any real danger posed to capitalism by the Labour leader. The mere suggestion that action could be taken against the arrogant, bloated ‘big six’ energy companies found an immediate echo among working people, many of whom have been forced to choose between ‘heating or eating’: 73% supported Miliband’s suggestion of a price freeze made at the Labour Party conference. Even Blairite commentators, such as The Guardian’s Jonathan Freedland, recognised that many would go much further than Miliband: "Sixty-nine per cent of the public want to see the energy companies renationalised. A similar number would like the railways back in public hands. Any action on petrol prices would enjoy huge approval. Miliband can draw comfort from the knowledge that the 50p top rate of tax commands 68% of support, with equal enthusiasm for Labour’s proposed ‘mansion tax’ on £2 million-plus properties". The capitalists’ fear is that Miliband could inadvertently trigger off similar demands for action against others ruthlessly driving up the cost of living: the train companies, housing speculators, food monopolies, etc. The lying machines of Rupert Murdoch, Lord Rothermere and the rest of the dictatorial capitalist media, therefore, have gone into overdrive in their slander campaign. Miliband has been accused by the Daily Mail of driving "a hammer and sickle through the heart of the nation". His passing reference to ‘socialism’ on a soapbox in Brighton means that he has embraced Karl Marx’s Capital and has undertaken a violent lurch to the left, according to Tory chancellor George Osborne. If only! The Daily Mail, infamous traditionally for dipping its pens in mad dog saliva to lie and vilify the labour movement and its leading figures, not only attacked Miliband, but his dead father, Ralph. He was "the man who hated Britain". This was despite the fact that, as a refugee from fascism, Ralph Miliband fought in the second world war in the British navy against the fascist dictatorships. It was the Daily Mail and its owner Lord Rothermere who embraced the British fascists of Oswald Mosley, symbolised by its infamous headline in the 1930s: ‘Hurrah for the Blackshirts’. Rothermere, the present owner’s grandfather, also showed his sympathy with the Nazis in his appeasement policy towards them, supporting the Munich agreement between British prime minister Neville Chamberlain and Hitler’s regime. Similarly, Winston Churchill, the alleged heroic leader in the ‘war against fascism’, had praised Mussolini in 1927 and hoped that, in its ‘hour of need’, Britain (read capitalism) would find a similar figure to save it from ‘the threat of Bolshevism’. Ralph Miliband, and with him the left and the labour movement, was accused by the Mail of betraying the country which harboured him as a refugee. But it is the capitalists who at critical moments have been prepared to betray the ‘nation’. Witness the refusal of the cowardly French capitalists to arm the working class in 1940 to resist the Nazi invasion because they were haunted by the example of the Paris Commune, when the outline of the first ‘workers’ state’ was established. They feared that if the working class acquired arms – as in 1871 when the German army was also at the gates of Paris – it would rise against the French capitalists. The capitalists clearly understood that, not only could the armed people defeat Hitler but they would also turn their guns on their own exploiters. They would then go on to establish their own rule through a democratic socialist revolution which would have reverberated throughout Europe, overthrowing the hated Nazi regime in Germany, as well as Mussolini and Franco in Italy and Spain. It is the working class and labour movement which embodies the interests of the real ‘nation’, the majority of the population – not the monarchy, House of Lords, the bankers and capitalists, and all the paraphernalia of capitalist rule. It represents the overwhelming majority of working people, which increasingly draws behind it big sections of the middle class. This is especially true today as the ConDem coalition government of David Cameron and Nick Clegg crushes the hopes of the middle classes for the future. The Observer recently informed us that the sons and daughters of the middle class will not, under the present system, enjoy the same living standards as their parents. It is just taken as read that the youth of the working class face even worse prospects on the basis of capitalism. The Daily Mail is well known in the labour movement as the ‘Forgers’ Gazette’ because of its involvement in the infamous so-called ‘Zinoviev letter’ of 1924, which was used to bring down the first Labour government of Ramsay MacDonald. But it could not repeat this success in its ‘modern’ attack on Miliband and his father. A far greater scepticism of the muckraking methods of the Mail and similar gutter papers now exists in Britain because of a higher cultural level, the existence of social media, etc. Seventy-two per cent of the public thought the Mail was in the wrong for attacking Ralph Miliband. Even 57% of Daily Mail readers opposed its vile editor Paul Dacre. Polls reveal that 31% of regular Mail readers did not vote for the Tories in the 2010 election. Therefore, the claim that it represents a broad spectrum of ‘the people’ is false. Tory luminaries, like former cabinet minister Michael Heseltine and Thatcher’s biographer Charles Moore, also rushed to condemn the Mail. Moore defended Ralph Miliband, his former teacher, as ‘a good man’. On the other hand, Peter Mandelson, past public relations front man for Tony Blair and New Labour, seized this moment to attack Miliband’s condemnation of the energy companies! The Daily Mail’s claim to a widespread readership is because of its sports coverage, and its muckraking, especially of celebrities – achieved through employing more journalists, instead of routine ‘churnalists’ – rather than a consolidated right-wing readership base. Moreover, it is not above the occasional feint towards the ‘left’ as it showed in its relentless pursuit of the murderers of Stephen Lawrence. Leon Trotsky once commented that the Times newspaper, as a journal of record (before it became ‘Murdochised’), told the truth nine times out of ten, the better to lie on the crucial occasion when it was vital for the interests of the capitalists. The Mail, on the other hand, lies nine times out of ten and may tell the truth, or something approximating to it, on one occasion as a means of burnishing its mainly right-wing ‘populist’ credentials! This incident has many dimensions, including highlighting once more the role of the press in bolstering the rule of the ‘have yachts’, while suppressing and distorting the views of the ‘have nots’. At the time of the MPs’ expenses scandal, as well as popular revulsion at widespread hacking, there was a general clamour for action against the press lords and the introduction of a more democratic and equitable access of the people, and especially the labour movement, to the media. While rushing to the defence of his father, Ed Miliband was very careful to distance himself from his views as a committed Marxist. Ralph Miliband argued that the Labour Party in the 1950s was not "radical enough and needs changing if it’s to deliver socialism rather than collude with the financial interests of the City and US foreign policy". He argued then that it was possible "to make Labour truly radical". In this sense, at that time he concurred with the Marxists within the Labour Party, later gathered around the journal Militant (now the Socialist Party), that the Labour Party remained a vehicle for the socialist aspirations of the working class and could be changed in a socialist and Marxist direction. In Marxist terms, it was a ‘bourgeois workers’ party’ with a pro-capitalist leadership, even at this stage, but with a worker base, particularly in the trade unions, that remained faithful to the socialist vision upon which the Labour Party had been built, particularly since 1918 and the adoption of the socialist Clause Four, Part IV of its constitution. During the Labour government of the 1960s Ralph Miliband changed his views and, bitterly disappointed in the Labour leadership, argued "that a new party was needed". At that stage, this was an ultra-left position, as subsequent events demonstrated, particularly with the success of the left, and especially the growth of a powerful Marxist force around Militant. The titanic struggle in Liverpool of 1983-87, led by the Liverpool Labour Party with Marxists at its core, demonstrated this, as did the mighty anti-poll tax struggle. This forced the resignation of Thatcher, the ‘Iron Lady’ herself. Owen Jones, the left-wing celebrity, has recently described Miliband as an "old-style social democrat". This is completely wrong and is used by Jones to justify his continued adherence to the idea that the Labour Party is still a vehicle for socialist change. Social democrats in the past subscribed to a long-term vision of socialism, but differed with Marxists, for instance, on how to achieve this. They saw capitalism, wrongly, as a ‘mixed economy’ and advocated piecemeal reform, at a snail’s pace if necessary, as in the famous symbol of the Fabian Society. 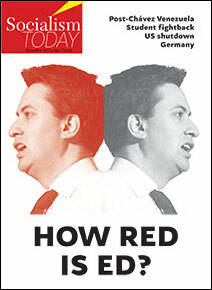 This is not how Ed Miliband sees either the Labour Party today or himself. He made this clear by defending his father, while differentiating himself politically from him: "My father’s strongly left-wing views are well-known, as is the fact that I have pursued a different path. I have a different vision… So the idea of me being part of some ‘sinister’ Marxist plot would have amused him and disappointed him in equal measure, and for the same reason – he would have known it was ludicrously untrue. I want to make capitalism work for working people, not destroy it". Those who proclaimed themselves as ‘social democrats’, such as Tony Crosland in the 1950s, would never have dared to have come out with such blatantly pro-capitalist sentiments. Hugh Gaitskell, the right-wing leader of the Labour Party, may have wanted to move in this direction, but was defeated when he tried to remove Clause Four. It was the unions that opposed its elimination rather than the official Tribunite left within Labour. In the 1950s and 1960s – remember, at the time of the greatest boom in the history of capitalism – there was an organised Labour left. This left was a constant thorn in the side of the right wing which was attempting to shift the Labour Party rightwards, in the spirit of what had happened in Germany when the SPD abandoned its socialist goal at its Bad Godesberg conference of 1959. The attempt of those on the Labour left today, like Owen Jones, to argue that there has been no fundamental change in the class character of the Labour Party beggars belief. Not just on the issue of Clause Four, but on other crucial questions such as the original anti-union legislation proposed by Labour in 1969 (In Place of Strife), as well as on the Vietnam war, the resilience of the socialist base of the Labour Party defeated the right. When prime minister Harold Wilson and the employment secretary Barbara Castle attempted to introduce this legislation they were met with strikes and mass demonstrations. This culminated in trade union opposition being expressed within the Labour cabinet, with James Callaghan reflecting this and ultimately defeating Wilson. So great was the determination of the trade unions to see off this anti-union legislation that, had Wilson not retreated, he would have been defeated and probably forced to resign. Despite the threats of then US president Lyndon Johnson, Wilson could not give open support in the form of British troops participating in the Vietnam war – called the ‘American war’ by the Vietnamese – without risking a complete schism in Labour’s ranks. Blair, however, had no such difficulties in bulldozing support for the obscene Iraq war through the purged Labour Party conference, where the constituency ‘delegates’ were solidly on the right. Now the shrivelled remains of an enfeebled Labour left is no obstacle to Miliband’s open embrace of capitalism. This, incredibly, is his political posture six years into a devastating world economic crisis that will be the framework within which a possible Miliband government will come to power. The trade unions, on the other hand, are increasingly confronted with the dire consequences for their members of the crisis of capitalism and are under intense pressure to resist. The pain has been inflicted not just by the coalition government but by local councils, many of them led by Labour. This, of necessity, requires not just an industrial opposition, but increasingly also a political stance. This has raised once more the issue of the trade unions’ Labour link. Some unions, notably Unite, have attempted to use their political weight to effect changes within the Labour Party. This led to a Tory and press campaign saying that Unite was pursuing an ‘entry tactic’ to gain power in the party and push aside the New Labour creatures. They are the real bourgeois infiltrators who have managed to destroy the Labour Party as a specifically workers’ party. Unite’s predecessors, with the trade union movement as a whole, created the Labour Party in the first instance as a political expression of the unions. Yet Miliband responded to this campaign with a shameful attack on Unite in Falkirk, Scotland, which was exercising its right to promote the selection of a candidate who politically agreed with the union rather than right-wing New Labour clones. Miliband even called in the police to investigate and lay charges ‘if necessary’ against members of Unite. Shades of the methods of the rotten, right-wing social democratic leaders in Germany of 1919, Noske and Scheidemann! This in turn has led to the owners of the Grangemouth refinery taking steps to sack one of their employees, Stevie Deans, the Falkirk Constituency Labour Party chairperson suspended for a time by Labour for his alleged role in the candidate selection. This has provoked a successful strike ballot and now a lock-out from the employers. As with the witch-hunt against Militant in the 1980s, which began with taunts from Thatcher to extirpate Marxism from the Labour Party, this was orchestrated by her successor, Cameron. We predicted when Militant supporters were being expelled that they may come for us in the morning but later it would be the turn of others on the left and what remained of trade union influence in the Labour Party. Miliband is now proposing a special conference to scrap the collective voice of the unions within the Labour Party. The Socialist Party declared that this attack on union influence should be met with an emergency conference of the trade unions to discuss the possibility of them disaffiliating from the Labour Party. Together with the FBU fire-fighters’ union and RMT transport workers’ union and others, Unite should call a conference with the idea of setting up a new mass workers’ party. This is a litmus test for the leaders of the trade unions, particularly those on the left. Even seemingly ‘moderate’ union leaders, like Paul Kenny of the GMB general union, expressed angry opposition to Miliband, threatening to withdraw affiliation fees from the Labour Party. Inexplicably, Len McCluskey of Unite seemed to strike a different note, appearing to be relaxed about the reduction of trade union power within the Labour Party. If this had been accompanied with moves to set up an alternative new party, it would have been a step forward. But Len McCluskey praised Miliband as an opponent of neo-liberalism and as the most left leader of the Labour Party since Michael Foot! This is clearly not the case, as indicated by the above remarks of Miliband wanting to reform capitalism in crisis. You could not compare the situation in the Labour Party today with the 1980s when widespread demands for the nationalisation of key industries were official party policy. Both at national and local level, as Len McCluskey himself recognises, New Labour is firmly entrenched in the camp of capitalism. At this critical juncture, it is vital that those with authority among working people, particularly the left of the trade unions like Len McCluskey, give a clear political and industrial lead. We salute Unite for its recent record of never repudiating workers who have taken unofficial strike action and, indeed, providing all the material assistance necessary for them to win. But the same resolve should be shown on the political plane as well. Teachers, civil servants, fire-fighters and Royal Mail workers – confronted with the recent scandalously rushed privatisation and the looting of their industry by big-business spivs – have been compelled to come out on strike. More will join them in protest at the massive worsening of conditions, including falling pay, which has been on a downward trajectory since the coalition came to power. Osborne has promised at least another seven years of austerity right up to 2020. The so-called recovery is completely fake as far as most working people are concerned. It is taking place largely in the pockets of the rich who are skimming off the cream of what little ‘growth’ has taken place. Nor can British capitalism expect to escape via the export route because, as the Red Cross has shown in a devastating report, the whole of Europe is "sinking into a protracted period of deepening poverty, mass unemployment, social exclusion, greater inequality, and collective despair as a result of austerity policies adopted in response to the debt crisis of the past four years". Capitalism is not working and nor can it on a broad scale, even with Miliband at the helm in a new Labour government. Capitalism is a system based upon production for profit and not for social need. It cannot be made to operate in the interests of the great mass of the population who face a bleak future, particularly in this era of deep-seated crisis for British and world capitalism. This is one of those moments in history when a patchwork solution will not work. Root-and-branch measures representing a fundamental break with capitalism are required. Miliband does not propose this. He did not even suggest the re-nationalisation of the energy industries, or even of Royal Mail, which the Labour-supporting writer Kevin Maguire described as a ‘betrayal’ in the Daily Mirror. Moreover, the recently appointed shadow education minister, Tristram Hunt, shamefully declared that Miliband’s New Labour is signed up to continue the goals of so-called ‘free schools’. Crawling on his belly, he has apologised for past critical remarks. Yet Sweden has already demonstrated where ‘free schools’ end up: with the privatisation of large parts of education and the ownership of schools by big business, including speculative hedge funds. At the same time, Rachel Reeves, the new shadow works and pensions secretary, promises to outdo the Tories in scapegoating and demonising the poor and unemployed. Kicking out some uber-Blairites from the shadow cabinet and ‘balancing’ this with the ejection of Diane Abbott as a party spokesperson – although she hardly stands firmly on the left these days – does not mean a shift towards the left at the top of the Labour Party. A government led by Miliband will not be fundamentally different to the present coalition. In reality, nothing will fundamentally be gained by working people from a Miliband government. It is not even guaranteed that Miliband will get sole power; he could go into a coalition with the Liberals on the basis of his present policies. In this critical juncture therefore it is vital that a clear political direction is given to workers and young people who are looking for an alternative. No time can be lost. It is possible that Len McCluskey is waiting until after the next election before he pushes for a new party, in the expectation that a Labour government coming to power will fail to help the working class. But the workers cannot wait. There is naturally a fear of some well-intentioned trade union leaders that a declaration now for a new party could result in a split within their ranks. The British trade union movement has an enviable record of maintaining a principled unity within its ranks. And the left, in particular, has been to the fore in upholding this. The ‘unity of the graveyard’, however, is another matter entirely. It is possible that, if a declaration for a new party is made, some disgruntled officials may organise resistance. But they would find little echo among ordinary members who are sick to the back teeth of right-wing New Labour. When the FBU and RMT separated from the Labour Party, there was no movement against the leaders of these unions. The tide of history is against those who cling to a strategy of defeat, which is what continued adherence to New Labour means. The time to act is now. This is what the Trade Unionist and Socialist Coalition (TUSC) is all about. It is gathering forces now for a real alternative. It is clearly a minority today but events are pending whereby the heavy battalions of the working class will join with those like TUSC in creating a new, mighty pole of attraction for this battle.